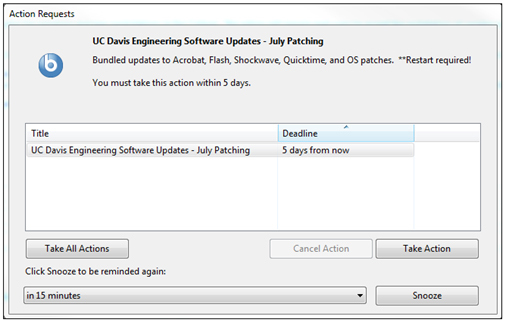 UC Davis Cybersafety Policy requires critical security patches to be applied to all network connected computing devices within seven days of release from the vendor. Given the number of computing devices connected to the College of Engineering networks and the frequency of critical security patches, traditional software delivery methods are not feasible. BigFix, a patch management tool, is licensed for all University-owned computers. This tool enables IT to effectively manage the distribution of critical software patches for most computer operating systems (Windows, Mac, Linux, and Unix). Additionally, the tool enables IT to distribute new software packages quickly and easily.The campus has selected BigFix as the standard patch management and software distribution tool.